High-powered businessmen are turning up tortured around the city of Edinburgh with one specific thing in common — a sinister double life involving pedophilia. Leaving his ‘victims’ in a disturbing state, the individual responsible calls the police and lays bare the evidence of their targets’ twisted misdemeanours to discover, along with a special memento of their own troubled past — a chilling calling card. Once again heading the investigation team is Detective Sergeant Taylor Nicks, along with her partner Detective Constable Marcus Black, who are tasked not only with tracking the perpetrator down but also dealing with the unusual scenario of having to arrest the victims for their own barbarous crimes. But with the wounded piling up the predator’s thirst for revenge intensifies and soon Nicks discovers that she is no longer chasing down a sinister attacker but a deadly serial killer. 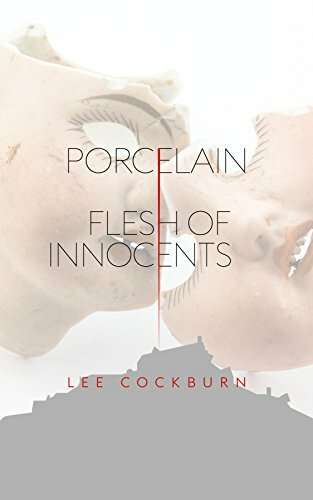 Vivid, dark and deeply unsettling Porcelain: Flesh of Innocents is the perfect next read for serious crime and police thriller fans. Well this has to be one of the most intense police procedural/thriller novels that I have read. You will find yourself completely engrossed in the police investigation and that of the vigilante that take the law into their own hands. This book does come with a warning as there are scenes of children being abused in the most horrendous manner. It describes in detail what happens to these children, the affect it has on them and the appalling conditions in which they live and also includes violent and explicit adult scenes. The story begins 22 years ago as twins Nathan and Amy face another day of constant hunger, abuse and cold with the only comfort they can find is in each other. A brother protecting his sister as much as any 5 year old can against their mother, who enjoys to watch her children being abused with her boyfriend. There will be a day when it ends but can it really go away? In present day the police certainly have their work cut out as a vigilante sets about to even the score up against the paedophiles. The sadistic attacks from early years of mental scaring becomes obsessional, it seems that no matter how many depraved people face the wrath of this avenger, there will always be plenty more to fill the gap. These are no random beatings there is precision and reason behind every action to ensure the paedophiles will never even be able to take part in even any normal relationship ever again. Each attack is different and leaves nothing for your imagination to fill in. The police are there to protect everyone though, including the bad guys, as how can you justify one brutality with another? They make a formidable team but personal lives and work aren’t always the best of mixes. I really liked this team, they had a bounce about them that at times made the atmosphere sizzle especially among themselves. This is an extremely well written book that will keep you up until you turn the last page. Lee Cockburn hasn’t danced around the edge this subject of child abuse it really is a tell it as it is story. This is the second novel in the Taylor Nicks and Marcus Black novels. A third novel will be available in the near future.